I first met Celebration a few years back, when they invited me over to their home to discuss an upcoming show. I had just left a Snoop Dogg concert downtown, so Katrina and Sean’s place in Remington was a welcome change of pace. While this was the first time I had met the band, I’d spent a handful of years prior infatuated with two records from my hometown – Celebration and The Modern Tribe. Somewhere between then and now we began working together and this month our label, Friends Records, is releasing Celebration’s highly anticipated new LP, Hello Paradise – Electric Tarot. This is the band’s first release since their last record, which came out three years ago on the prestigious 4AD Records out of the U.K.
Celebration has remained a Baltimore phenomenon, planting their seeds in this town over ten years ago when Sean and Katrina relocated from the Midwest to Baltimore. They’ve experienced a variety of different influences and scenes, finding their place in each and every creative nook and cranny. 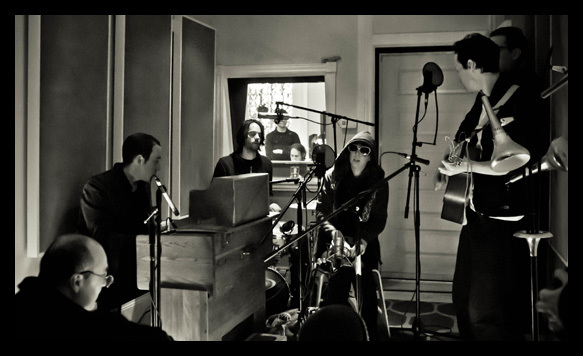 Their current form is a six-piece lineup that summons a fierce blend of psychedelic soul from beyond. Thursday’s cast was slightly stripped down for a Microshow performance at our friendly neighborhood Mobtown Studios. 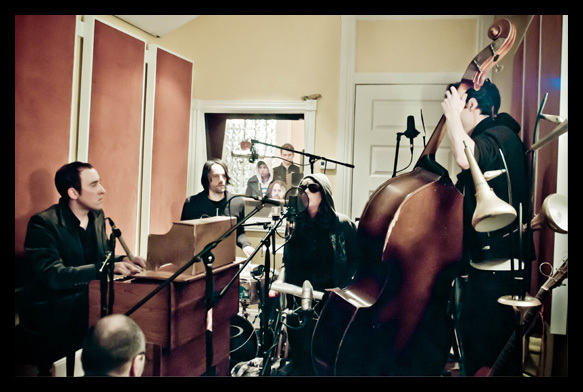 Five of the six current members performed, with Walker Teret on upright bass and guitar and Tony Drummond supporting vocals and keys. Old favorites like “Pressure” and “Holiday” were on the set list, while “Open Your Heart” from Hello Paradise and new songs like “Don’t Stop Dreaming” and “Solstice Rite” offered much to boast for the band’s current stage of evolution. What is this current state of being, you ask? A growing beast of metamorphic galaxies, shaped and molded by the city of Baltimore. This, as opposed to the sharp twists and capitalistic truths of the bloated and waining music industry they once steered their journey away from. Thriving on their surroundings, their current agenda involves the Electric Tarot — a project where each song and/or video represents a different card in the deck. The first nine cards will be found on Hello Paradise – Electric Tarot , while this Mobtown session may offer a glimpse into the Tarot’s future. Celebration marches onward, as their first physical product in years hits turntables worldwide at the end of this month. They’ll play shows along the East Coast, with their release party taking place on March 5 with Future Islands and Arbouretum at Baltimore’s 2640 Space. Tickets are available online through Missiontix, and also at Red Emma’s.